I’m gearing up for a new animation project (SURPRISE! It’s Star Wars related) and I wanted to add some more depth to my characters. So, I draw and create the characters in Flash and then export a PNG sequence to be compiled in Premiere. Before I bring in the sequence I’m experimenting with performing a batch render on the images to add an Inner Bevel to them. This will give the flat characters a shadow and a highlight. It’s not perfect for a 3D shaded character, but it can be a fairly automated process. 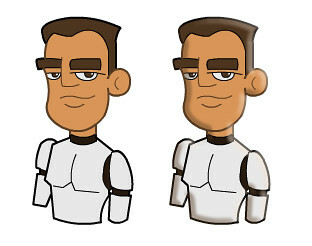 The image below is the before and after of this process.Â I’ll have an animation test posted a bit later. You know, I”m just glad that every male pic you’ve drawn for the past 20 years has a trace of YOU! The perfect man. At least in my eyes, right? I love you truly! Previous story Beware the Sinister Six!